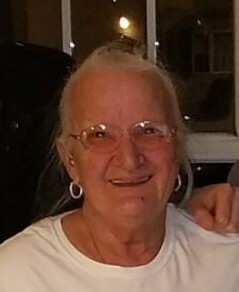 Elizabeth A. Campanella (Martin) 71 of North Providence passed away peacefully on Monday, April 1, 2019. Born in New Bedford, MA., she was the beloved daughter of the late Domingo and Mary (Sancha) Martin. Elizabeth was employed at Cherry Hill Manor for 33 years before her retirement. She is survived by her loving children, Nancy St. Mary, George St. Mary and Michael St. Mary and his wife Susan; brothers, David, Michael and Norman Martin and a sister, Donna Martin. She is also survived by her cherished grandchildren, Michael Jr., James and Chris St. Mary, Maria, Nicole, Cheri and Lisa Silvio and Diane Wakim and dear great-grandchildren, Dante, Andrian, Mariah, Jason, Gianna, Vincent, Julian, Julez and Brandon. She was the sister of the late Ronnie, Bobby and Ricky Martin. Visiting hours will be Friday, April 5th from 5-8pm followed by a funeral home service at 8pm at the A.A. Mariani & Son Funeral Home, 200 Hawkins Street, Providence. Burial will be private.